Last night at the Met the main event—as planned, anyway—was the debut of the celebrated bass-baritone Wolfgang Koch as Scarpia. But another newcomer, this one jumping on on just a few hours’ notice, to my mind nabbed the show to herself. Anyway, Isaev proved to be in just about every way a lovely Floria, beginning with one of those “typically Romanian” warm, soft-grained lyric sopranos brimming with des larmes dans la voix. There was a hint of Angela Gheorghiu in the soprano’s gentle legato and febrile stage presence. The highlight, not only of her performance but of the whole night, was “Vissi d’arte,” meltingly sung in a shimmering mezza voce with a charming sense of humility. 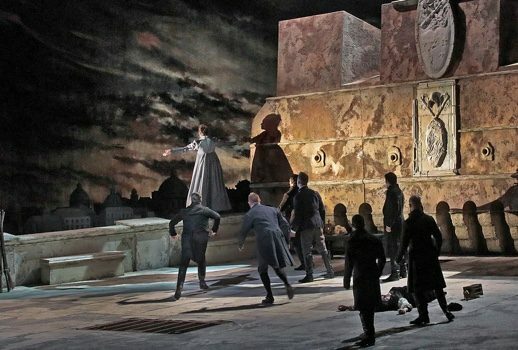 It was moving to hear a Tosca who genuinely seems pious rather than wallowing in self-pity, or, as another interpreter of this role did earlier this season, to jettison the religious entirely in quest of flaunting diminuendo effects. The very top of the voice is a bit suspect, with the act two high C’s all flying wild. The one in the last act, though, landed and lacerated. Isaev proved herself always an adept stage technician. Despite the pointless and distracting rake on John Macfarlane‘s fussy period sets, the soprano executed every cross and gesture with accuracy and even a certain ladylike grace. She proved particularly meticulous at rearranging the train on her second act frock, which mysteriously has since the New Year morphed from an anachronistic off-the-shoulder 1960s’s mother of the bride’s dress into something suggesting an Empire court gown. If the level of care Isaev took with her stage movement left Tosca seeming a little less than spontaneous, that’s a fair trade for so expert and error-free a cover performance. For her heroic effort, this artist—and the Met audience—surely deserve a scheduled reprise or two. Koch’s strong point as Scarpia was a distinctive dramatic take, with a chalky face, sunken eyes and a wearily courtly demeanor. He moved slowly and deliberately, letting his immense size dominate the surroundings. The part is very much in his voice, a cultured snarl in the middle giving way eventually to some veristic half-shouted high notes. The complete effect was perhaps not the most electrifying, but it was consistent and I think all the more menacing for its subtlety. Those silverly pianissimi are just as pretty as can be, but it’s a little off-putting to see a man on the brink of death acting quite so self-conscious about spinning our his ravishing tones. The effect was that the condemned man foreswore his final meal in favor of spending his last moments reviewing his Marchesi exercises. Of course that vantage point also gave me a perfect view of the distracting Te Deum chorus, which for all the world looks like an entire touring company of Pride and Prejudice dropped in to take Communion.